Monarch Air Group provides private air charter in Sacramento, CA. Our clients benefit from top-notch service, unrelenting dedication to safety, wide selection of aircraft, and years of experience in chartering private jets. To obtain a free quote, please use our online quoting tool provided below, or call toll free 1-877-281-3051. Monarch Air Group offers private jet charter services to and from Sacramento, CA, USA. Located in Central Valley at the confluence of the Sacramento River and the American River, Sacramento is California’s state capital. 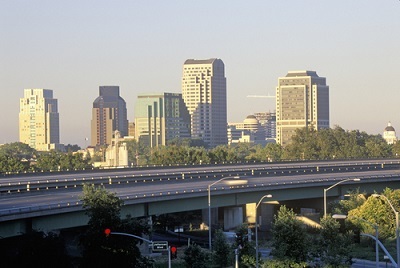 Established as a supply town for gold miners, nowadays Sacramento is one of the fastest growing regions in the United States. There are Gold Rush-era attractions, California State Capitol tours, world-class recreational facilities, unique shopping, vibrant dining, and outdoor activities. Often named “The City of Trees”, Sacramento boasts plenty of gardens, parks, tree-lined streets, and greenways. The most popular tourist attractions include Old Sacramento, the California State Capitol, Fairytale Town, the Sacramento Convention Center Complex, the Eagle Theatre, the Community Center Theatre, the Sacramento Zoo, the California Hall of Fame, the Cesar Chavez Park, and many others. Having the rich history of California’s Wild West, entertainment activities, and stunning scenery, Sacramento is a wonderful destination for all visitors worldwide. 11. LVK, Livermore, Livermore, United States. 12. MCC, Mcclellan AFB, Sacramento, United States. 13. MHR, Sacramento Mather Airport, Sacramento, CA, United States. 14. MYV, Yuba County, Marysville, United States. 15. NOT, Novato, Novato, United States. 16. OVE, Oroville, Oroville, United States. 17. PVF, Placerville, Placerville, United States. 20. SMF, Sacramento International, Sacramento, CA, United States. 1. Citizen Hotel, 926 J Street, Sacramento. 2. Delta King Hotel, 1000 Front Street, Sacramento. 3. Delta King Hotel, 1000 Front Street, Sacramento. 4. Governors Inn Hotel Sacramento Hotel – Newly Remodeled!, 210 Richards Boulevard, Sacramento. 5. Super 8 Sacramento State Capitol/Downtown, 216 Bannon Street, Sacramento. 6. Embassy Suites Sacramento Riverfront Promenade, 100 Capitol Mall, Sacramento. 7. Holiday Inn, 300 J Street, Sacramento. 8. Sheraton Grand Sacramento Hotel, 1230 J Street, 13th and J Street, Sacramento. 9. Citizen Hotel, 926 J Street, Sacramento. 10. Embassy Suites Sacramento Riverfront Promenade, 100 Capitol Mall, Sacramento.